The Geelong FoodShare, in partnership with Foodbank Victoria, will create a specialist food rescue and distribution site that becomes a substantial resource that will increase the amount of food distributed from FBV as well as locally sourced donations. This will have a direct and lasting benefit for existing emergency relief and community based food support programs in the Greater Geelong region. FBV would be able to ship larger amounts of food to the Geelong FoodShare depot and help facilitate more local collection of donated and rescued food. This model enables more fresh fruit and vegetables, dairy and frozen meals to be supplied to the ER agencies, community food support programs and schools in the area. There is substantial scope for targeted expansion in the Geelong region. 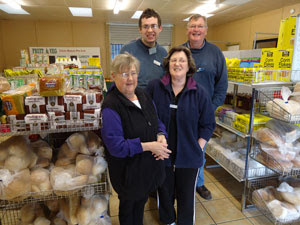 As a benchmark, the Wodonga FoodShare collected from local sources 63,000kgs in 2010 and 87,000kgs in 2011. The Geelong FoodShare improves access to better nutritional foods to those most vulnerable to food insecurity. The Geelong FoodShare depot will utilize large capacity commercial fridge and freezers to that the storage of more complex carbohydrates such as vegetables, fresh fruit, meat, fish and dairy products. These are vital components that enable meals to be made from the breads, pasta and cereals also available. Additionally, with the support of FBV, the Geelong FoodShare will look to increase allergy-free related foods, so that the most vulnerable families of the community can also access egg, wheat, lactose and nut free products. A significant impediment for local agencies to expand the amount and variety of foods they provide is having appropriate and adequate storage (dry, fresh and frozen goods). The Geelong FoodShare will provide a facility that takes responsibility for the sourcing, storing and distribution of food for existing programs. A central resource that allows agencies to access it on an ‘as needs’ basis will alleviate the need for individual agencies to invest in large fridge/freezer capacity, meet rising energy costs as a result, and manage unexpected large food donations. The Geelong FoodShare will help break down the barriers of access to quality food availability as well as being able to respond to the changing demographics of the Greater Geelong region by ensuring culturally appropriate foods are also made available. combined collection and distribution of the 3 agencies food is still not eating the needs of agencies providing food programs. Depending on the food item, the ‘gap’ between supply and demand is between 30-50%. It is therefore common for collaboration and sharing to occur, because no single supplier will meet the total demand. By way of example, in Dandenong the depot receives excess from SecondBite and Fareshare collections in the area, and similarly, if either of these agencies is short of product for their distributions, they are welcome to access stock from the depot. The Geelong FoodShare has the capacity to develop training and employment pathways for clients of our partner agencies. Working with local training providers, it would target the most needed skills in the Greater Geelong region, including warehouse/logistics, hospitality, ICT and horticulture. o the freezing of funding arrangements from the State government for subsidised freight across Victoria. This mean that local agencies will face reduced availability for subsidised freight from Melbourne. 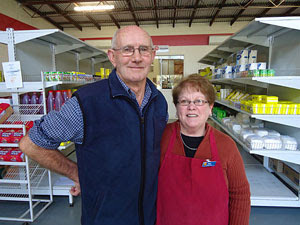 However, FBV have guaranteed that all food orders will be delivered FOC to the one new Geelong FoodShare depot in Geelong. 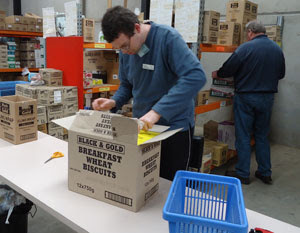 By using the Geelong FoodShare as a bulk distribution centre, it is hoped that the changes to service delivery to individual agencies is minimized. Arrangements could then be made for discounted, refrigerated freight deliveries by the Geelong Food Relief Centre, or free self-pick up as often as required. The Geelong FoodShare model would look to rationalise product offerings between the Minimart and the bulk access products. By ensuring items in the Minimart are targeted at items not available in the bulk access areas it will be possible for agencies to make sure that each client will access a greater range of products at no additional cost. A new Geelong FoodShare depot will have access, if required, to other FoodShare funding submissions FBV is making to State government and other sources. This could bring more resources from outside Geelong into the region. The Geelong FoodShare model allows for a greater range of volunteers to be engaged as their activities can be independent of any one particular agency and/or the tasks on offer have a greater variety. The Geelong FoodShare, as an extension of FBV, will be ready to assist in supporting our community during emergencies (flood, bushfire, etc. ), in conjunction with local and State Government emergency management plans and other service organisations. A significant benefit of the Geelong FoodShare is that it will become the aggregated voice of Emergency Relief in the Greater Geelong region. Having a united voice as a rallying call for food collection and distribution in the region will change the communities perception of ‘charity competition’. This will attract more media coverage, sponsorship opportunities, volunteering opportunities, new food supply sources and Government support. A taskforce needs to be established to instigate and manage an independent business plan that reviews the following and then creates Working Parties to tackle specific required actions. Geelong Food Relief Centre is working to ensure the Taskforce will contain the right mix of experience to produce the best outcome for Geelong. The Geelong Food Relief Centre provides emergency and supplementary grocery supplies to those in need in the Greater Geelong region and outlying areas. Customers, who have been individually assessed by a welfare agency, are able to shop with their voucher at our Mini Mart and choose from a wide variety of goods. Last year approximately 24,000 adults and children were assisted. To help keep our shelves full we depend on donations from organisations such as yours. We would like to see our calendar for 2012 filled with a different appeal running each month. It can be as simple as just a box in the staff room, or one in every branch, or maybe a one-off appeal for your social club. Please feel free to be inventive and come up with an idea you think will work for you, and for us. November Ford Motor Co. Employee Collection of donated goods. A little bit saucy – sauces, dressings etc. Spread the love – jams, vegemite, peanut butter etc. Make it quick – instant pasta packs, noodle packs, rice meals etc. Of course we are happy to have more than one appeal happening each month and collections will be arranged promptly when requested. We can arrange for one of our Committee members to speak with you to explain more about our Mini-Mart, Kickstart Breakfast, Mobile Market and other programs. If you would like to help in anyway, we would love to hear from you. The Geelong Food Relief Centre is working with Foodbank Victoria to develop an exciting new program for the Geelong Region. If your agency is currently receiving food supplies either directly from Foodbank Victoria or through the Geelong Food Relief Centre Mini-Mart or bulk distribution service, this new program will directly affect you. The Community Foodshare concept is basically a regional warehouse designed to allow communities such as Geelong, more efficient access to emergency relief resources – primarily food. It will also help facilitate more local collections of donated and rescued food. Instead of having multiple sites run by different agencies that store and handle food, a Community Foodshare provides a facility that takes responsibility for the sourcing, storing, and distribution of food for all of the existing programs. This will reduce the need for individual agencies to meet the cost of refrigeration equipment, energy costs and struggle with rostering volunteers and manage unexpected large food donations. The most successful Community Foodshare-style programs currently operating are located in Wodonga, Dandenong and Warrnambool. Across the state Foodshare models are now supporting a wider variety of programs such as soup kitchens, school breakfast clubs and many other community meal programs. The key aspect of these programs is that they are built around need: supporting agencies to meet these needs with the provision of fresh nutritious food is where Foodshare comes in. The Foodshare model proposed for Geelong will take into account all the expanding needs of the agencies currently being served and look at ways to ensure a sustainable supply of emergency food relief in the coming years for these and other agencies who would like to be involved. To assist with planning the most relevant and importantly sustainable model to meet Geelong’s needs, Foodbank Victoria is providing a free workshop in Geelong. This workshop, titled “Sustainable Emergency Food Relief”, has been delivered across the State to help communities build robust and sustainable programs. 1. To identify what the needs are in your region. 3. How to support communities to provide sustainable ER programs that meet real needs. Help shape the direction of the Geelong Food Relief Centre’s plans for a Community Foodshare by ensuring that your expertise and input are reflected in the key outcomes from this workshop. Geelong Food Relief Centre Inc.
A not-for-profit, charitable co-operative of welfare agencies serving the Geelong, Bellarine, Surf Coast and Winchelsea areas.